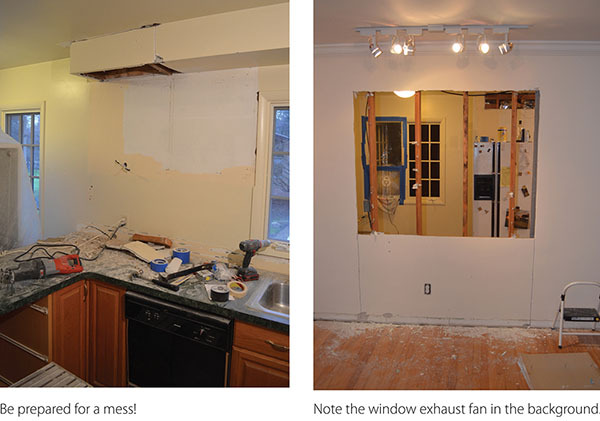 As stated earlier, a “kitchen designer” played a vital role in our kitchen remodeling project. We used one of the staff designers at NuWay Kitchen and Bath in Macomb. Looking back on the project, I highly recommend their design services. From command of the latest virtual software to her thorough knowledge of the newest trends, materials, cabinet styles, appliances and more, the NuWay designer saved us countless hours in research and problem-solving. There’s no short-cut. Kitchen remodeling-design takes time. The old cliche; measure twice and cut once is critical. A wide variety of floor plans, cabinet styles and traffic patterns should be explored. Let your latest ideas sit for a few days…then re-evaluate. Visit as many different kitchen showrooms as possible. Walking through real kitchens in a variety of settings (as opposed to viewing pictures in magazines or online) adds new and meaningful dimensions to the design process. One important lesson I learned during the research process was that painted 5-piece kitchen cabinet doors can show unsightly stress cracks in corner seams. This is particularly true in our extreme Michigan climate. Those corner “cracks” will (eventually) appear no matter what you do to prevent them. In comparison, 5-piece stained cabinet doors (though they have the same joints), don’t show the corner lines as cracks. Painted doors (because of the contrast between the paint and the actual seam line) can cause that joint line to be much more visible. This is an important detail that typically might only be revealed after a cabinet purchase. 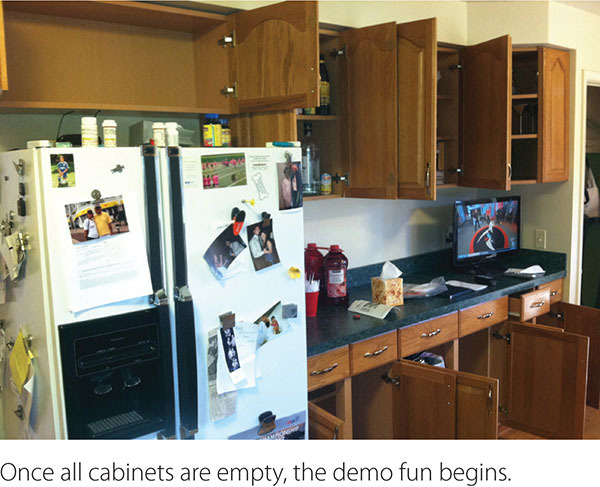 This issue was revealed to me as I researched painted cabinets on display in various showrooms. Then I researched this topic further using online blogs and “the fine print” from cabinet manufacturer websites. Sure enough, these “cracks” are a common issue and rarely get talked about. Perhaps seam cracks might not bother you…yet they sure bothered me. Bottom line: Invest personal time in the design process. Nobody knows you better than yourself. As important as your kitchen designer may be, I believe your building contractor / cabinet-installer is even more important. For starters: GET PERSONAL REFERENCES. Talk to friends, family and/or co-workers. You want an experienced contractor with a strong portfolio of finished kitchens. Be sure to talk candidly about fees. The fact is, when remodeling a kitchen in an older home, the scope of the the project is certain to change and grow. How will your builder handle these unforeseen detours? In my case, we agreed to an hourly rate and I monitored his progress carefully. Another important ingredient in the relationship between you and your builder is daily meetings. Discuss and define all daily tasks. Use that meeting time to also address any “tweaks” or adjustments in the previous day’s work. My kitchen remodel lasted more than four months. Candid and frequent communication helped us work together successfully for the entire time. 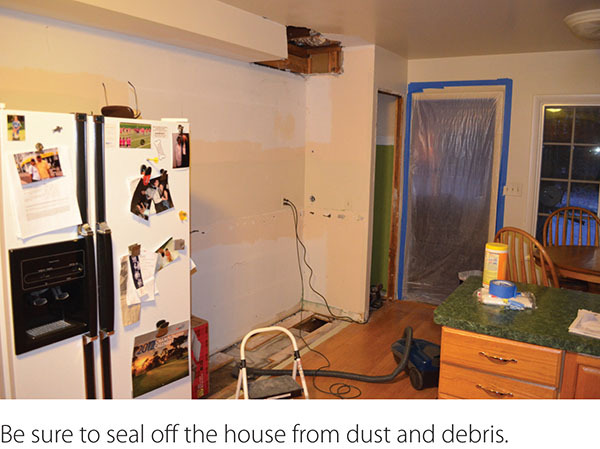 When it comes to kitchen demolition, careful planning is important. Be prepared for a mess. If you can, vent all dust directly out of a kitchen window during the worst of your demo days. To keep the air as healthy and dust-free as possible, I jury-rigged a fan wedged into a kitchen window blowing outwards (on high). We also taped plastic sheeting over all door openings. And lastly – don’t forget to seal off your cold-air returns. You certainly don’t want the demo dust circulating back into your furnace or AC. 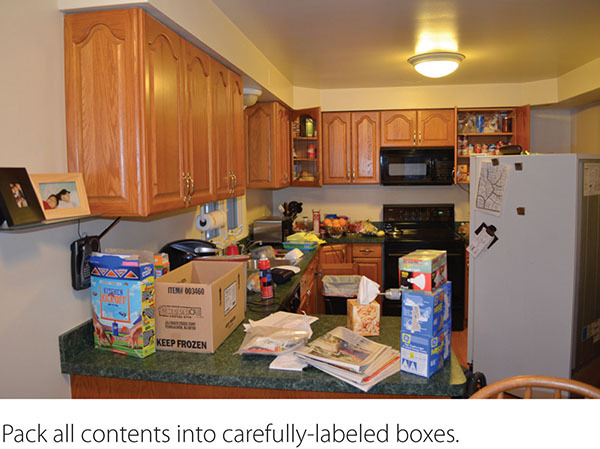 As you remove items from your existing cabinets, CAREFULLY LABEL YOUR STORAGE BOXES. Chances are you’ll be desperately seeking a can opener, cork screw, salt & pepper shaker (or something) in the coming weeks and months. When it comes to replacing those items once your kitchen is complete, your box labels will be very helpful in organizing your new cabinets. In my third and final installment, I will share my experiences on cabinet installation, purchasing appliances, the importance of sealing the grout lines on your new tile floor, how we added a few personal touches to our finished kitchen, how much we love our informal seating area, our big pantry and more.